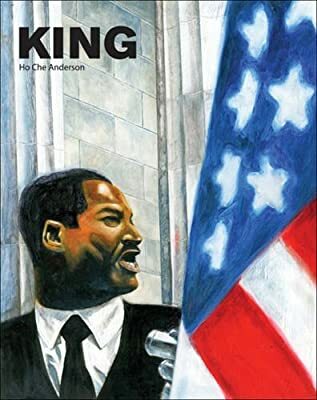 Books Set In: King: A Comics Biography of Martin Luther King, Jr. Author: Anderson, Ho Che Set In . . .
Over 10 years in the making, Anderson's biographical graphic novel has the weight and depth of a lifetime of research. The book is a compelling and often moving narrative of the life of Martin Luther King Jr. Anderson follows King from boyhood through college and into the stormy civil rights movement. But while the broad narrative of King's life may be familiar, this is hardly a Classic Comics approach to the man. In order to capture the complexity of King's life and times, Anderson employs a uniquely multifacted and multilayered graphic and narrative technique that falls somewhere between cartooning, painting, collage and documentary photography. It is deeply effective. At times, King's life is a straightforward narrative, but then a Greek chorus of voices will interrupt to comment on the action and other different versions of events. At other crucial moments, the pages errupt into color abstractions or expressionist renderings. Anchoring all this dazzling technique is Anderson's acute ear for dialogue and profound understanding of his subject. In the simplest scenes of King and his colleagues in discussion-in a car, a bar or a living room- Anderson makes history palpable. Through a varied graphic arsenal and subtle prosse. Anderson's King comes alive.